Online betting has allowed a whole heap of new bets to come into the industry, with one of the most intriguing ones being the ability to bet on how many corners and cards there’ll be in a match. It’s another one of those bets that needs little explanation, with the title telling you everything that you need to know. You’re literally betting on how many corners and cards you think there will or won’t be during a football match, usually choosing from the likes ‘Under 4’ or ‘Over 3’. It’s a more interesting and exciting bet than more standard wagers such as Match Betting, thanks to the fact that there can be so many variables within the bets themselves. I’ll explain it all in more detail here, looking at what Points are given for in terms of bookings, as well as things you can look out for before placing your bet. If you’re bored of just betting on the ‘norm’ then this is an option you should consider. You’ll notice that BetVictor separate these bets off into their own section, such is the desire from some to bet on Corners in a match. Generally speaking, the various markets can be split into their own categories, which are Over / Under and Teams. The first of those involves betting on how many corners there will be in a match or in one half, selecting something like ‘Over 9’ or ‘Under 5’. The second needs you to choose which team will get the most corners or which side will be the first to be awarded three corners etc. 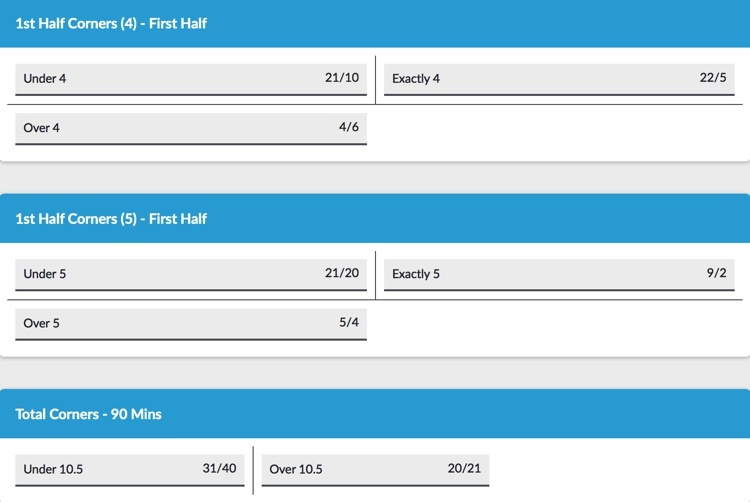 They’re not the only bets you can place on Corners ahead of a game getting underway, with other fun markets being the likes of the time of the first corner to whether or not there’ll be a corner in the fist ten minutes of the game. It’s an exciting way of betting on something a little bit different from the norm and is worth considering if you’re watching a match that you don’t really care about and fancy making it a little bit more interesting for yourself. There’s an ‘Asian Handicap’ market, too. That works much like Asian Handicap bets on other topics, wherein teams have a handicap applied to them according to the form that they’re in. A team that’s stronger will need to get more corners for bettors to win bets placed on them, for example. If it’s not a market that you’ve bet on before then make sure check it out before doing so. When it comes to In-Play betting on corners, the markets become a little bit more limited. You’ll likely be able to bet on the number of corners within the match or during one of the halves, but it’s likely to be restricted to the Over / Under (or Exactly) market. 2-Way Corners removes the ability to bet on the number of corners being exact, instead offering an Over / Under on something like 8.5 corners. 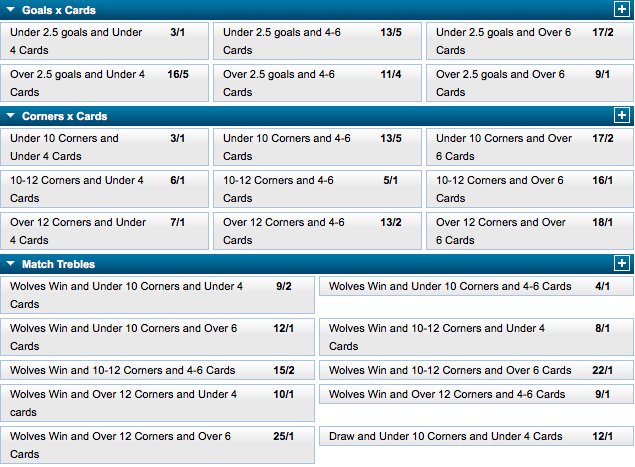 If there are more than 8.5 corners then Under will win, fewer and Under will be the victorious bet. The world of Card betting is similar to Corner betting in many ways, though there are differences. Firstly, you can bet on the first player to be shown a card, including the idea of no bookings being shown at all during the match. You can also bet on whether or not there’ll be a sending off and, if you want to, be specific about which player will see red. When to comes to the number of cards shown, bookies tend to operate on a system of Points. 10 Points are awarded for a yellow card and 25 Points are given for a red. The most that an individual player can be awarded is 35 Points, so being sent off for receiving two yellow cards doesn’t count as 45 Points, for example. You can obviously also bet on the time of the first card received by each team, much as you can bet on when teams will be awarded a corner. 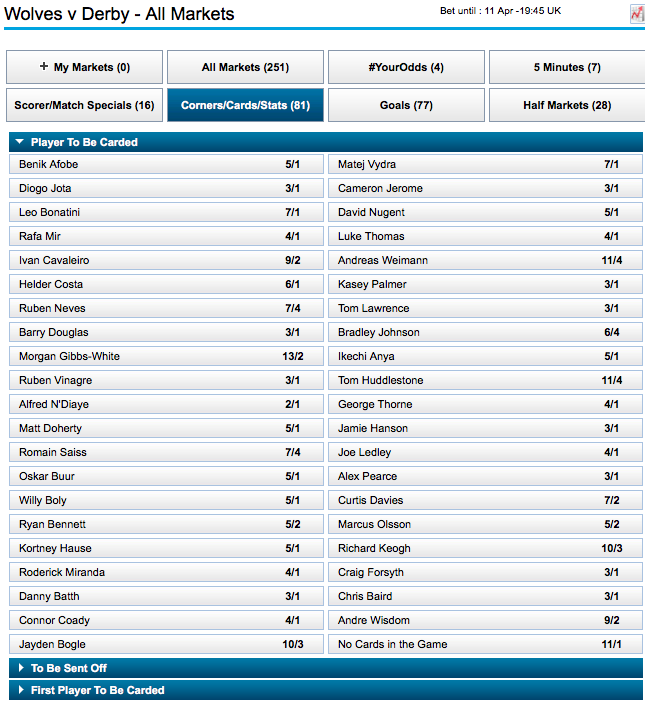 You can see from that list of bets that there are all sorts of interesting combinations, including Match Trebles. That’s where you’ll bet on the number of corners won, the number of cards shown and the match winner. It’s all exciting stuff to bet on, again giving you the opportunity to make a boring match slightly more exciting. If you’ve read any of my other pieces on this site then you’ll know that I’m a massive fan of research. The development of the internet might well have resulted in more betting opportunities, but it’s also led to a huge increase on the amount of information that’s readily available for us to find about any given match, team or even player. Something as simple as the BBC Sport website is a good place to look, with a ‘Match Stats’ section at the bottom of a match report telling you how many corners each team won during the game and a handy graphic of cards shown to each player underneath the ‘Line-Ups’. Some managers seemingly don’t like football. They’re not interesting in the clever stuff, happily ceding possession to the opposition and choosing instead to instruct their players to just hoof the ball up the pitch at any given opportunity. If they do that then the likelihood is that they’re going to put a lot of stock into winning set-pieces, with corners seen as a major way of winning an advantage. That’s worth thinking about for two reasons: firstly, how often do they tend to win corners in matches their playing in? Secondly, might the opposition do something to counter that tactic? I remember once doing my research on West Bromwich Albion under the management of Tony Pulis and seeing that they’d won seven, six and then another six corners in the three matches preceding the one that I was betting on. I was convinced that the Baggies would aim to win a large number of corners again, given that Pulis loves setting teams up to take advantage of set-pieces. The manager of the opposition team, Jürgen Klopp, had prepared for it and told his players, “no set-pieces, no set-pieces, no set-pieces”. Both teams got four and I lost my bet. Some players might not be all that talented but are exceptionally good at taking set-pieces. This fits in with the tactics chat to an extent, but managers that might not ordinarily set their teams up to win corners might decide to go hot and heavy for that tactic if they have a player in their squad who is particularly capable of taking them. In the past, the likes of David Beckham would be someone who knew how to take a corner, so Manchester United might target winning them against teams that tend to concede a lot of them if he was on the pitch. In terms of cards, some players are more hot-headed than others and that’s worth remembering when it’s time to place your bets. If you know from your research that one player tends to get booked a lot, especially in games against rival teams, as an example, then you’ll want to bear that in mind when you’re looking at the best wagers to play. Combine a player that tends to be combustible with my next category and you could be confident of betting on a red card being shown at some point during the match. You would think, given the somewhat strict nature of The Laws of the Game, that referees would officiate the match in a similar manner to each other. Yet the reality is that they all use the excuse of many of the rules being open to interpretation to control matches in entirety different ways to each other. Thankfully, there is plenty of information out there to help you see how referees tend to officiate games, with the Premier League’s own website being an excellent place to start. There are even some sites that will let you know how referees tend to deal with specific teams. This one is a little bit more tricky to talk about definitively, but it’s certainly true that some referees tend to officiate high-profile matches more leniently than might do otherwise. Oftentimes they’re concerned that their refereeing will be examined more meticulously for the biggest matches and might be poured over in the media so, rather than be accused of ‘ruining the match as a spectacle’ or something along those lines, they’ll allow some harder tackles to go unpunished than if they were refereeing a game that isn’t on TV. On the other hand, some referees try to put their stamp on a match early doors by ‘proving’ that they won’t allow the game to get out of control, so they’ll book players for seemingly innocuous challenges. Make sure you investigate how each referee has controlled previous matches when they’ve been on TV in prime time and use that information to help you with your betting. If you’re looking at the Combination Bets market then remember that one thing could lead to another. If you think that there are likely to be a large number of cards shown in a match, say, then that will increase the chance of a player being sent off. That will, in turn, increase the chances of one team winning over another. Likewise a match that contains a lot of corners might well also contain a higher number of goals, so don’t think of the different categories as being mutually exclusive.